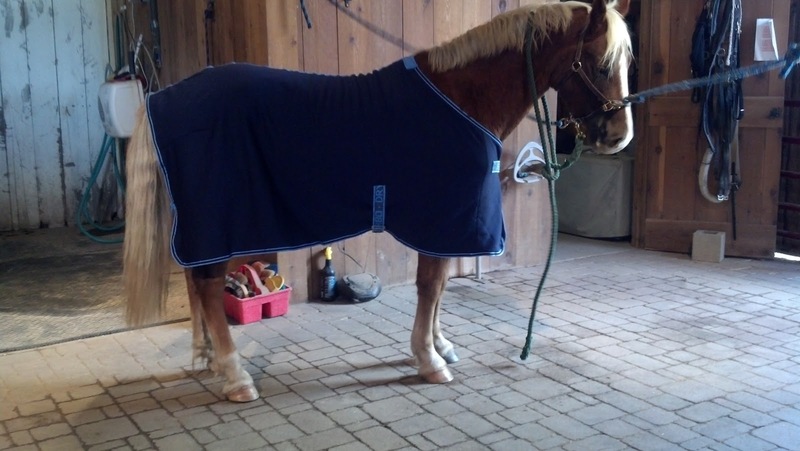 Last winter I borrowed coolers, specifically a Rider's International one with a neck and an off-brand one without, both polar fleece. They did a good job, and I do miss the neck on the RI cooler, but I have to say that I am sold on this one. I'm still holding out on clipping/blanketing until he gets a full coat and it stays below 60 degrees, so he's hairy, and we're working quite hard in the grassy field: he's getting pretty sweaty. The Turbo Dry cooler is smooth and sort of shiny on the outside (and completely sawdust/hay repellant) and a lighter synthetic fleece-like material on the inside. I love the chest closure, which is a traditional metal blanket fastener as well as heavy duty Velcro that goes over it; it's really secure. My only complaint with the hardware is that I wish it had two belly straps like a normal blanket, but that's minor. 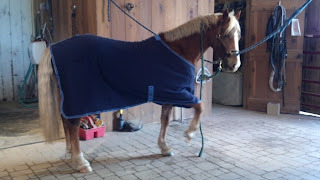 After my rides, I've curried him, gave him a rub down with a towel, and then put him under this for about ten minutes or so. By that time, he's gotten to the point where I'd be comfortable blanketing him. I don't have any scientifically measured data to back up this claim, but I'd say it's cooling him out in half or two-thirds of the time the other coolers took. It's definitely faster. My other favorite part about this cooler is that it came in a round plastic bag with carrying straps that's about a foot long and six inches in diameter. 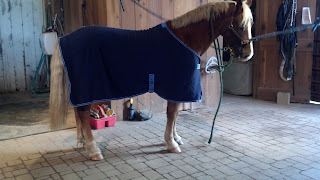 When I'm ready to put it up, I can roll it back up, put it in that bag, and hang it on the rack outside of his stall or put it in my tack trunk, because it takes up very little room. I can see this being heavily used at spring and fall shows as well. The best endorsement is that others in my barn, including my trainer, are interested in purchasing one now that they've seen mine. At $48, it's very reasonable, and I'm sure it could be monogrammed if you want. Centaur TurboDry cooler: Connor approved! Hue has one of these coolers and I LOVE it. It dries so quickly. Riva has a Centaur too! Got it last year, have washed it, looks and works great. Mine does have 2 belly straps - wish it came up the neck, would be the only think I would add. I'm glad I'm not the only one that likes it. Kelly, I am jealous that yours has two straps! I feel like that would give me some flexibility that I don't currently have.